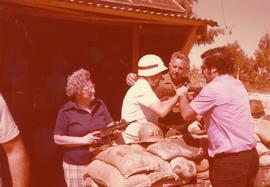 Photograph depicts Ben and Esther Dayson at border post in Israel. Esther holds Uzi submachine gun and Ben tries on Military Policeman's hat while he aims an FN rifle. 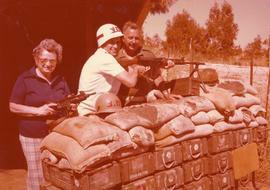 Photograph depicts Ben and Esther pose for a photograph with an Israeli soldier at the Lebanese border. Photograph depicts Ben and Esther Dayson in playground at Daycare in Israel. Photograph depicts Ben and Esther Dayson inside Daycare in Israel. Photograph depicts Ben and Esther Dayson planting trees in Israel. Ben and Esther Dayson standing in front of the Dome of the Rock on the Temple Mount in Jerusalem. Photograph depicts Ben and Esther Dayson standing in front of the Dome of the Rock on the Temple Mount in Jerusalem. Oral history interview with Ben and Rita Akselrod. Kodachrome 35mm slide depicts a closeup of a blue cloth with Hebrew writing, hanging in front of the Western Wall, in the Old City of Jerusalem, Israel.